[2-in-1 Portable Phone Charger] :A combination of phone charger and wall charger with AC plug , which work as not only a power bank but also a USB wall charger. 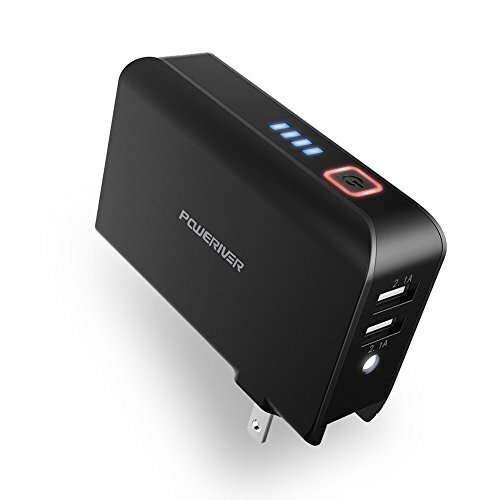 [Compact Size Andconvenient to Carry]:The USB wall charger is small,light and portable. It is very convenient for traveling or business trip.U can use this combo battery to charge all of your devices and save space. : Charge your device and get the phone charger recharged via a wall outlet, Built-in a foldable plug to ensure maximum portability. [Safety Certified Protection]:Safety system ensures complete protection for you and your devices.Built-in intelligent safety system ensures complete protection for your devices, including over-heat, over-charge, over-current, over-discharge and short-circuit protection. It is up to 500+ times lifespan, approved by CE/FCC/RoHs certification. [Smart Fast Charging Phone Charger]: 2 USB charging ports,each has own voltage output up 2.4A,and the smart charging technology set the charging current to match the maximum charging rate that your devices can safely handle. [Our Support Guarantee]: Our friendly and reliable customer service will respond to you within 24 hours! You can purchase with confidence, with our 18 month replacement warranty, or 30 days money back guarantee!